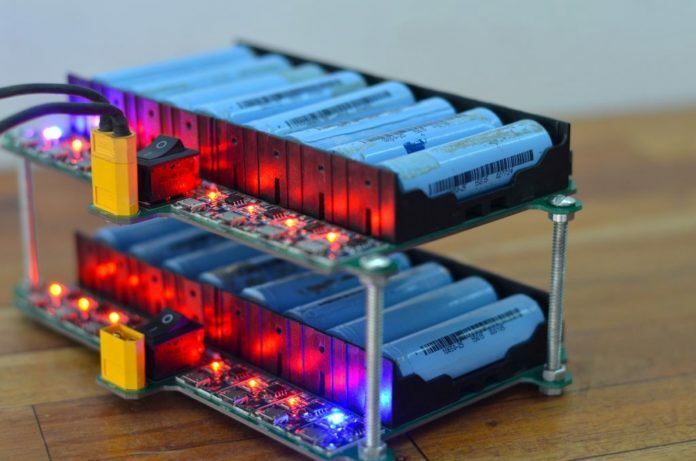 If you have a project that requires a DIY battery pack, you’re probably going to want to use 18650 lithium-ion battery cells. 18650 batteries are extremely common, and therefore inexpensive — particularly if you salvage them from old laptop battery packs or other sources. But, in order to use them properly they need to be balance-charged. Over on Instructables, DIY KING 00 has a tutorial for creating your own 18650 balance charger. DIY KING 00 designed this balance charger because they needed a battery pack for an electric bike project. 18650 batteries are perfect for the job, and he was able to upcycle used cells from two old Hoverboard battery packs. Because they’re used, they need to be balance-charged to ensure uniform potential so the new DIY battery pack is healthy. This balance charger will do that with up to eight 18650 battery cells, and is expandable to handle more by simply adding additional modules. To build one module, you’ll need DIY KING 00’s custom PCB and eight TP-4056 lithium-ion charging boards. Those boards each have a micro USB power input, but plugging in eight USB cables would be a pain. So, instead, each module has an XT-60 power connector that provides power to all eight of the TP-4056 boards. The only other components you’ll need are an LED, resistor, eight latching buttons, and battery holders. DIY KING 00 says each module only takes about 10 minutes to solder, so this is a quick and easy evening project.